I’m busy framing prints and packing up merchandise for a new exhibition at Hula Juice Bar and Gallery in the Grassmarket. On Thursday 8th May I will take residency at Hula Juice Bar and Gallery on Victoria Street, Edinburgh for a two month stay. I am currently framing prints and packing postcards, cushions and canvas bags so expect a total transformation in the popular old town cafe. We will also be running a special WhereArtI competition in the cafe, with eight of my prints on the wall being past WhereArtI sketches. Fill in a entry form when in naming the eight mystery locations and you could win a print and juice of your choice. the e-commerce factory liked this on Facebook. Helen Paterson liked this on Facebook. Jenny Duncan liked this on Facebook. Pat Swan liked this on Facebook. How exciting. Good luck with this project. Pamela Dobbie liked this on Facebook. Mary McLaren liked this on Facebook. Susan Doherty liked this on Facebook. Lorna Bridges liked this on Facebook. Amanda Human liked this on Facebook. Cheryl Dyer liked this on Facebook. Callum Finlay liked this on Facebook. Yu-ling Chen liked this on Facebook. George Lloyd liked this on Facebook. Joanne Kirkham liked this on Facebook. Chih-Wei Huang liked this on Facebook. 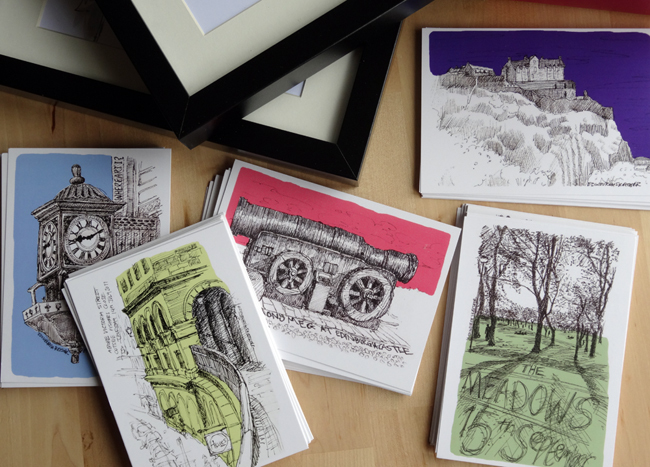 @edinsketcher @HulaJuiceBar Looks fab! Love these postcards.